Over at GamerDNA they’ve crunched some numbers on some key demographics of World of Warcraft players – the sample group are GamerDNA members combined with Armory data, so the sample is representative to say the least. 1. There remains a preference to sign up an Alliance character than a Horde one, particularly if the player is female. 2. The Hunter class is the most popular across both factions. 3. Men tend toward the more ‘manly’ classes such as Warrior. The most popular class, the Hunter, is slightly preferred by female players by the same margin in both factions. Same for Mages. 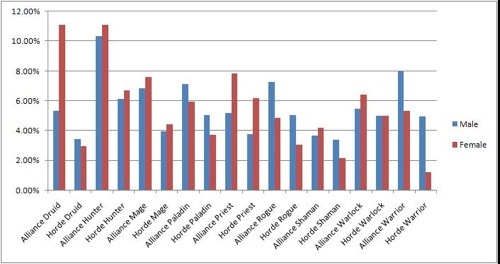 Priests skew heavily female in both factions, again by roughly the same margin. Rogues and Paladins have the same stair step proportion across the factions, but with men outnumbering women. More men play Warriors than women across the board, but the difference is more pronounced on the Horde side thanks to the whole “women don’t do Orcs” thing. The only flaw I can see in the gender analysis applies across all virtual worlds: there’s arguably a lot of avatars out there that are the opposite in gender to their real-world counterpart. Aside from the obvious interest of such stats to WoW players, there’s a much wider application. Don’t imagine that marketers, game developers and educators aren’t looking at data like this intensively. There’s a thousand PhD theses in this sort of information and a few hundred of them are likely well underway. If you’re a WoW player, do the statistics match your impressions? Linden Lab have released their metrics up until September 2008, and in the Australian context there’s been a slight drop in activity – 686,872.48 hours, which is nearly eight thousand hours less than last month. Across 10-15 thousand active users, that’s not a big drop and Australia maintains the 11th spot worldwide. – premium accounts (those that people pay a monthly fee for) continued their decline to 83,23, down from 84,883 last month and December 2007 highs of 93,219. It’s a mixed picture and I’ve had a lot of people ask me in recent weeks how the real-world economic issues is impacting Second Life. These metrics don’t point to a significant decline related to the worldwide economic downturn and I’m not seeing any erosion of confidence. That said, the worst of that downturn occurred in October from a public perception viewpoint, so next month’s metrics should make for fascinating reading. What are your thoughts? Are you seeing people spend less in-world? Have your spending habits changed in recent months? 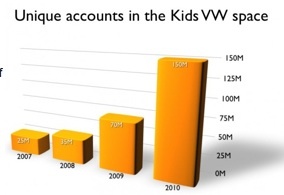 Virtual worlds metrics gurus, Kzero, have done some further hypothesising on the growth of the kids market for virtual worlds in the next year or two. 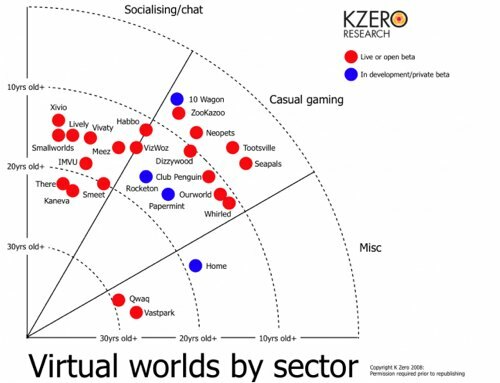 Metrics gurus Kzero have released a new breakdown of the age variances by type of virtual world frequented. There’s no big surprises but the figures do further emphasise the power of the pre-teen and teen market for social virtual worlds. Thanks to Pavig Lok for the heads-up. That’s the claim by Strategy Analytics, an international strategic and consulting services firm. Of course, registrations don’t mean too much, it’s the active users that do. That said, if ten percent of those billion end up active it’s still a large market. Add to that the likelihood of greater activity by registration as usability improves and we’re talking large numbers indeed. Thanks to Massively for the heads-up. K-Zero are a company that follow metrics in virtual worlds and last week they released their updated chart showing the number of registrations by platform over time. 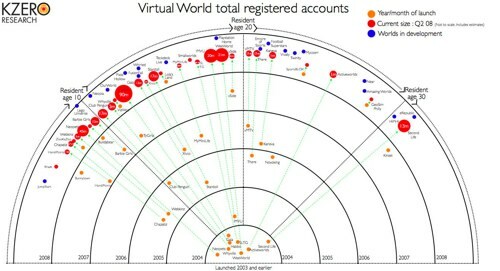 Note that gaming worlds like World of Warcraft (with more than ten million active users) aren’t even part of the 300+ million, which just further illustrates the growing depth of the virtual world population. Of course, an even more interesting measurement would be how many of those people remain active. Linden Lab have released their metrics through until the end of February 2008. 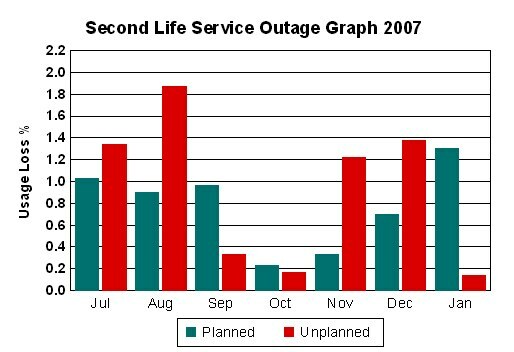 The regular downward trend has been reversed, with 12,245 active Australian Second Life users. That’s an increase from last month’s 10,885 and Australia remains in 11th place in terms of countries with active users. There’s still a fair climb to exceed previous highs and there’s no guarantee this is now an upward trend but at least the trend in the other direction has ceased for now. It’s fair to say things are still far from pretty on the stability side. Still more than one in five Second Life sessions end in either a viewer or region crash although there’s been a marginal improvement in frame-rates. How’s your stability been in recent weeks?